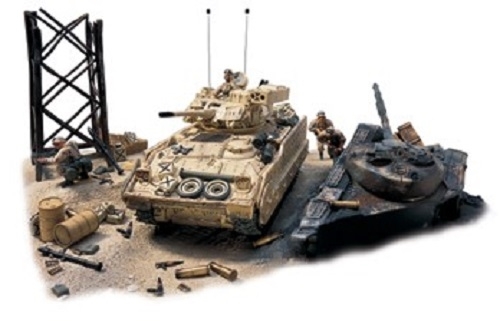 Produced in the Orient, the Forces of Valor line represents a brand new range of high quality diecast metal vehicles, aircraft, dioramas and figures. Vehicles are available separately or sold within specially designed dioramas protected by a heavy acetate cover. All of the vehicles feature working parts that include rotating turrets, elevating guns, moveable tracks and, where applicable, swing away side armor panels. Also comes with several combat figures that can accompany each vehicle. The GPA did see important use with US forces during the landing on Sicily on September 9th, 1943, but most of the vehicles ended up being passed to the Russian Army under the Lend-Lease scheme. The German Sturmgeschutz was one of the most successful armored fighting vehicles of the Second World War. It arose from an original concept of the pre-war panzer divisions, whereby a special vehicle for infantry support work was planned.